If you want to enhance your enjoyment of wine, the wine glass you select may make a difference. Many wine drinkers believe choosing glasses designed for specific types of wine can help bring out the flavors and aromas of wine, making the experience more enjoyable. Many types of wine glasses exist for general categories of wines. White wine glasses: These glasses are medium-tall and narrow with a long stem. Red wine glasses: Red wine glasses have shorter stems and wider bowls as compared to white wine glasses. Champagne flutes: Used to serve Champagne and sparkling wine, these glasses have long, narrow bowls that allow the bubbles to rise. Champagne saucers: These glasses are short and stout with a wide, shallow bowl. Stemless glasses: These wine glasses feature the bowl shape of the stemmed version but do not have a stem. Bordeaux glasses: These perfect "all purpose" wine glass are designed to hold both red and white wines. There are almost as many different wine glasses made specifically for a certain varietal of wine as there are different types of wine. Buying wine glasses this way can become expensive quickly. Unless you are a very serious wine drinker, less expensive wine glasses will do. 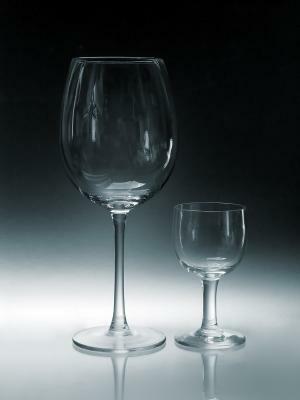 If, however, you would like to try glasses for different varietals, try the wine glass manufacturer, Riedel. Many consider this 250 year old company to be the absolute best when it comes to wine glasses. The reason so many people feel the shape of the wine glass should be matched to the type of wine you drink is that varietal or type-specific wine glasses are designed to enhance the wine's best characteristics including temperature, aromas, and flavors. The design of red wine glasses enhances a the specific characteristics of red wine. Shorter stems: Red wines best present their flavors and aromas at room temperature. Since these wines are most enjoyable when they are not chilled, holding the glass by its bowl will not cause the temperature of your hand to warm up the wine it contains. Because of this, the stems do not need to be as long, because it does not matter whether you hold a red wine glass by its stem or bowl. Large bowls: Red wines tend to have heavier tannins than whites. Aerating the wine helps to soften the tannins and release the wine's flavors and aromas. A larger bowl provides more surface area by which the wine can be aerated. Likewise, some suggest its tapered shape allows you to enjoy the aromas as you sip the wine while delivering the red wine to the right parts of the mouth where you have the best ability to perceive its flavors. The tall and elegant design of white wine glasses also serve a specific purpose. Longer stems: As previously discussed, holding a glass of wine by its bowl causes the heat from your hand to warm the wine it contains. White wines show their flavors and aromas best when chilled, and holding the glass by the stem keeps the wine at its ideal temperature longer. Smaller bowls: White wines do not need to be aerated to the extent red wines do, so the large bowl shape is unnecessary. Likewise, wineglass makers suggest the tapered shape delivers wine to the front of the mouth where you can best perceive its flavors. While manufacturers like Riedel suggest the shape delivers wines to the parts of the tongue where you can best perceive a certain type of wine's flavors, scientists have debunked the myth of the "tongue map," in which certain areas of the tongue better perceive flavors like sweet, salty, bitter, and sour. In fact, every area of your tongue that has taste buds can perceive each of these flavor profiles. Scientific studies have also found that wine glass shape does not appear to affect the perception of wine flavors at all - at least in a carefully controlled scientific environment. Instead, the perception of the effects of a specific glass on flavors may arise more from expectation, according to the studies. There are a few other considerations you may wish to take into account when selecting types of wine glasses. You can purchase either clear or colored wine glasses. In general, wine experts prefer clear wine glasses over colored glasses because it allows you to observe the color, clarity, and legs of the wine. Wine glasses are available in many materials. Many wine lovers prefer crystal glasses, because they feel the rough surface of the crystal allows the wine to breathe more. In addition, the reason many people enjoy crystal may be because of its superior light refraction that enhances a wine's colors, or because they enjoy the look and feel of crystal. While many wine lovers would be horrified at the thought of drinking Bordeaux out of a Burgundy glass, others feel there is very little difference. There is no definitive "best" way to enjoy wine. What matters is finding wines you love and enjoying them in whatever glasses you find that make the wine look and taste good to you.